"We first heard about the Battle Mountain meteorite on the morning of Wednesday, Sept. 5," said Willis. "We were on the road to Nevada the next afternoon." Meteorites are the remnants of asteroids and comets that have fallen to Earth. The challenge with these celestial visitors is that the longer they reside on Earth, the longer they are exposed to the corrosive effects of Earthly elements. JPL's miniature lab on a chip (information on the technology is available online), was tasked with looking for chemical markers and amino acids that originated in space, not manufactured naturally here on Earth. To give their new instrument a true test run, Willis' team needed a factory-fresh piece of the heavens. After a night at a local motel, Willis, along with fellow JPLers Amanda Stockton, Josh Schoolcraft, Fernanda Mora and Morgan Cable, packed hiking gear and a whole bunch of water into their SUV, and struck out for Battle Mountain, Nevada. Also along for the ride, and acting as the expedition's navigator, was J.P. Kirby. Kirby, a senior scientist from the Planetary Science Institute in Tucson, Ariz., was navigating because meteor sightings usually occur when the space rock in question is hurtling through the atmosphere tens, if not hundreds of thousands, of feet above the ground. With a long way between hurtling airborne fireball and ground, there is a lot of room for error in plotting potential meteorite impact points. To derive the best educated guess as to where meteorites could be found, Kirby worked with Mark Fries, also of the Planetary Science Institute, and chief scientist of Galactic Analytics, LLC, San Diego, to plan their expedition. "You read stories where people are taking their dog on a walk or do something else equally as innocuous and they stumble upon a meteorite," said Kirby. 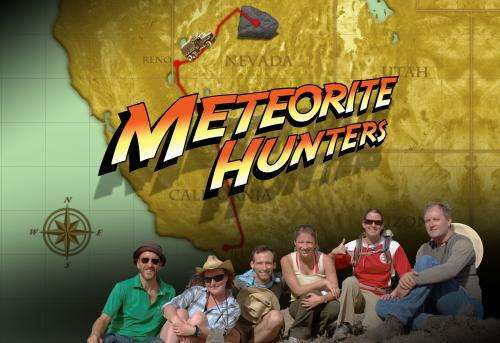 "Sometimes dumb luck does play a role in meteorite finds, but we were on a tight schedule, and the Battle Mountain area is big, hilly and treacherous, so a plan was definitely in order." Working with weather radar data as well as testimonials from those who witnessed the fireball, Fries generated an impact zone for the team to concentrate their search. Using a tablet, Kirby combined the Fries' strewn field map with topographical maps of the Battle Mountain region. "The first day, we covered 6 miles [10 kilometers] of mountainous terrain on foot but didn't find anything but terrestrial rocks and the occasional whiptail lizard," said Willis. "The next day was going to be our last shot, so we planned to drive much deeper into the estimated impact zone. The problem was, the most negotiable route ended up taking us through an active mine claim. We quickly found out that miners are not much interested in rocks from space." Since Battle Mountain is in gold mine country, and gold is worth its weight in gold these days, unannounced visitors of any ilk are generally discouraged. "We were fixing a flat when they drove up and told us to turn around," said Willis. "We needed to get the tire repaired anyway, so we headed back to town to regroup and look for a different route which didn't cross mining land." The new route made full use of their SUV's 4-wheel drive capability. 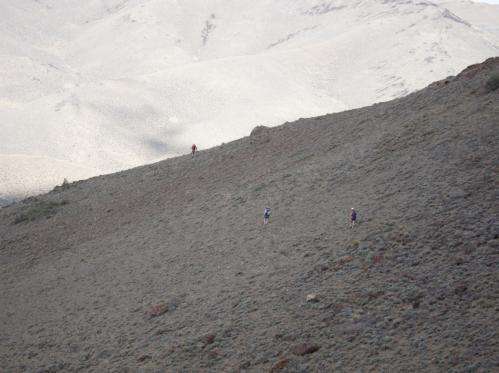 The team negotiated narrow, sloping, unpaved, sand-flooded switchbacks before arriving near the center of their estimated impact zone. By the time they parked, it was already mid-afternoon. For the next three hours, the team fanned out in different directions, but found nothing extraterrestrial in nature. By 4:30 p.m., it was getting to be time to wrap things up. The team did not want to negotiate those unpaved, dangerous switchbacks after dark if they didn't have to. At 4:30, JPL's Josh Schoolcraft had just begun the final leg of his search ... when he saw it. Sitting there on the mountainside, amidst a tangle of sun-bleached dirt, pebbles and scrub was a jet-black rock. "I knew right away it was what we were looking for," said Schoolcraft. "It was a carbonized, unweathered black mass, unlike anything else we had seen in our two days of searching. It clearly had not been there for very long." Schoolcraft signaled and soon everyone gathered, surrounding their 3-inch-wide (8-centimeter) piece of the sky. "Initially, everyone was basically freaking out," said Willis. "Then we got down to business and took pictures before collecting the meteorite in a sterile manner." On the way back to the vehicle, Willis heard more shouting and thought his team had found another meteorite. "But it was just an irritated rattlesnake," said Willis. "He went back into his hole and we went home, with a fresh chunk of outer space sealed in a sample bag." A 1.4-pound (630-gram) fragment of the Battle Mountain meteorite is currently undergoing analysis by the team's lab-on-a-chip systems at JPL.